Have you heard of dye-lots? 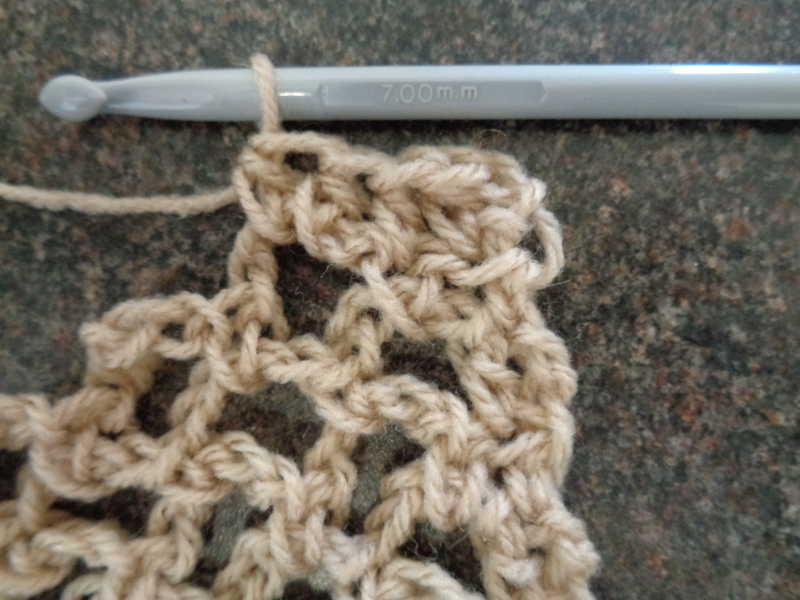 If you’ve been crocheting or knitting a while you will have, but if you’re a beginner… you need to know! Every yarn has a color of course, but it also has a dye – lot. The dye-lot is all the wool that was dyed at the same time. This means they will all be exactly the same color. You can find the dye-lot by reading the label next to the color. 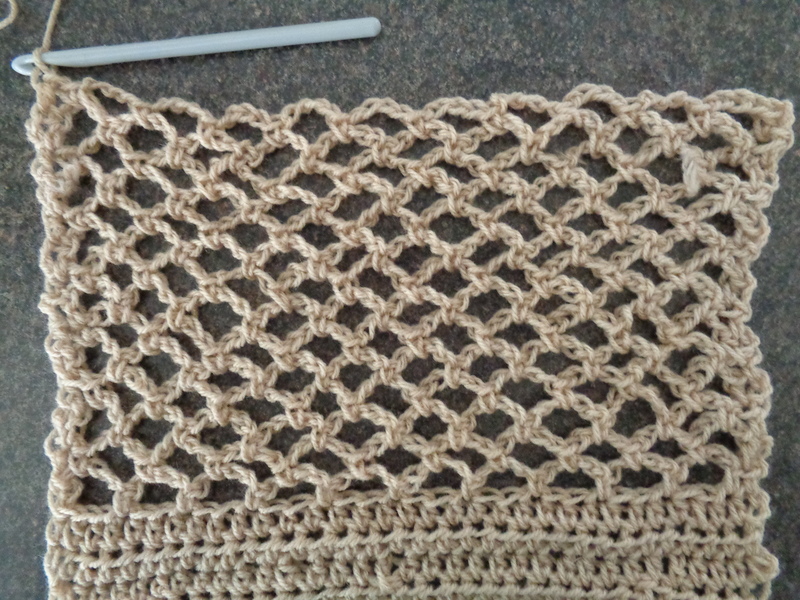 So when you go to start a new project, don’t just scoop up an armful of the same color – check the dye-lot to make sure they came from the same batch or you could wind up with a two-tone finished item that doesn’t look so good. What if you can’t get the same dye lot?? Firstly, don’t give up until you’ve talked to the store person, they may have another shop they can ring and get it from. It’s time to get creative. Treat the different dye lots like different colors. 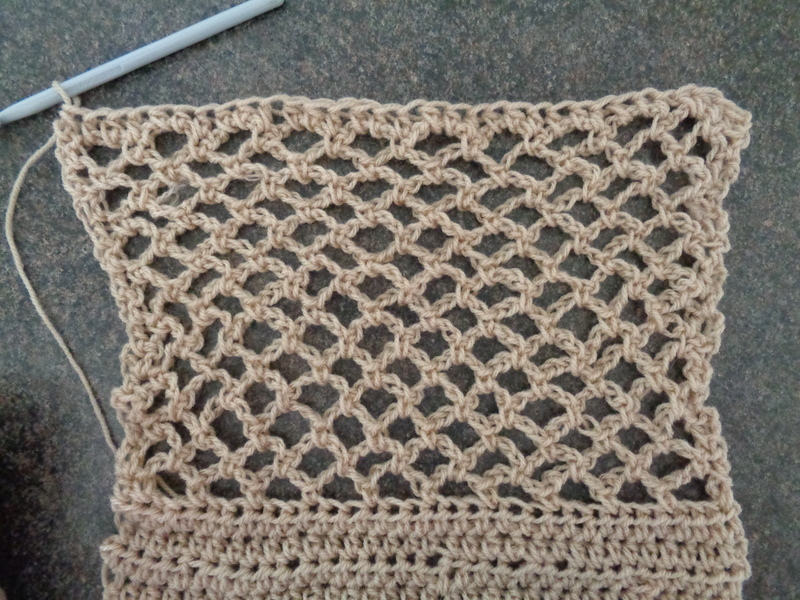 Work out a pattern you can use them in. 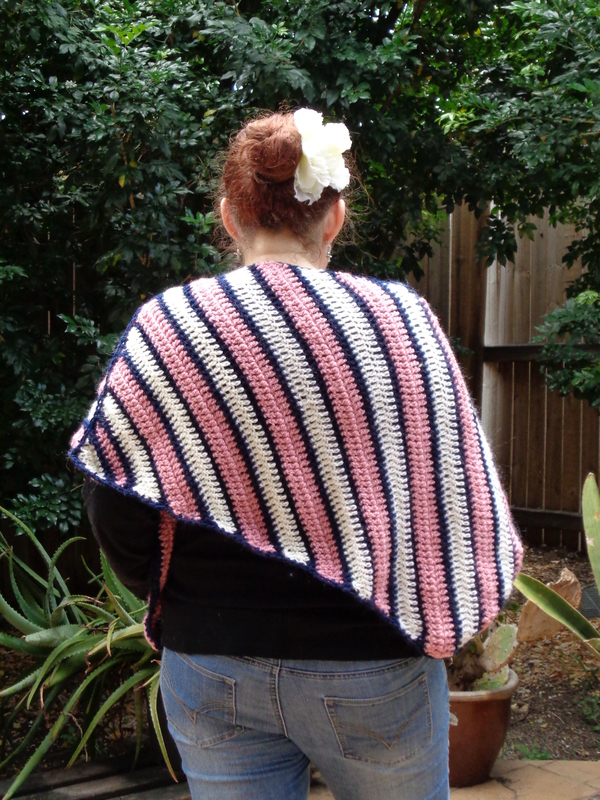 Try stripes or alternate motifs or what ever your project and imagination suggest. 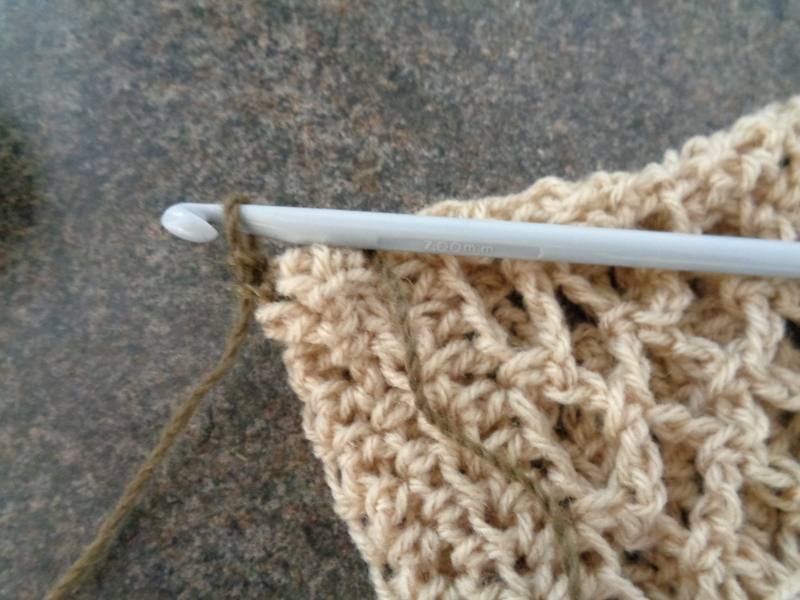 Or take the yarn back and get a different one. 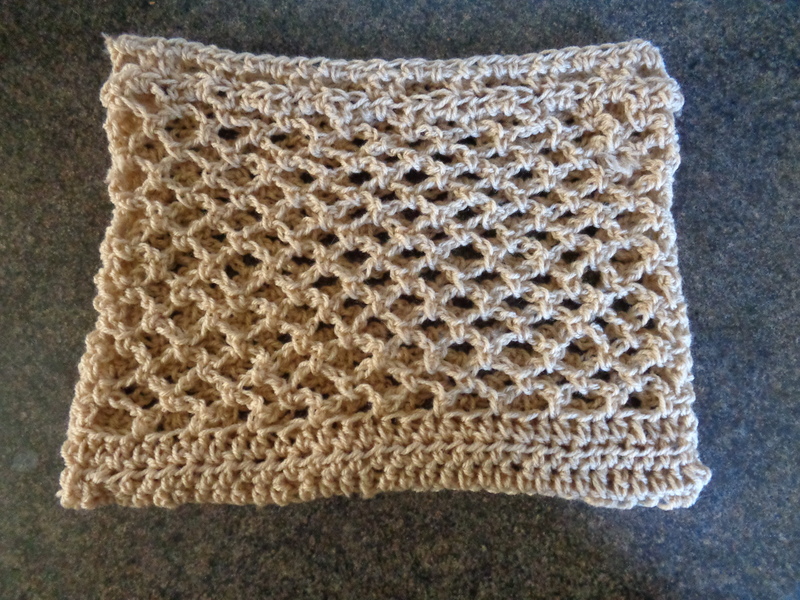 Here’s a project Emma used many different navy yarns on. 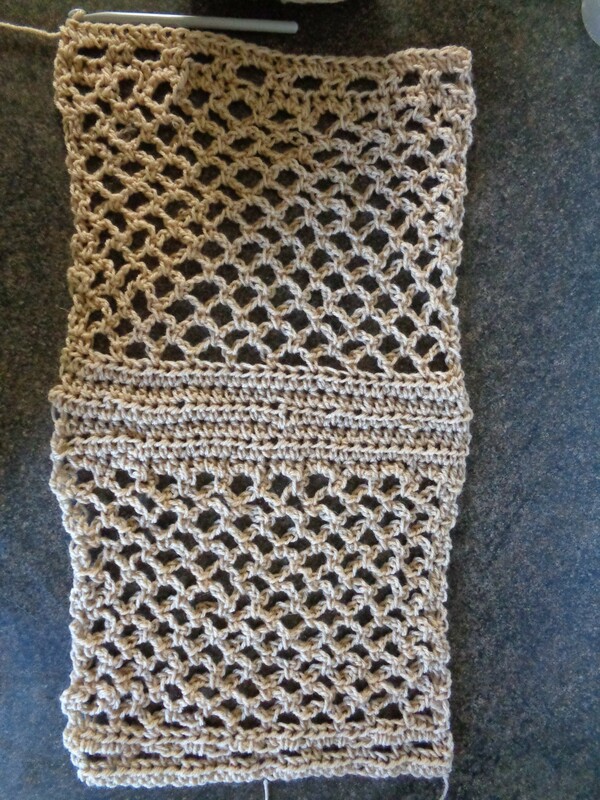 On the close up you can see how I used the different yarns in patterns. This is the Wheels Within WheelsWrap. 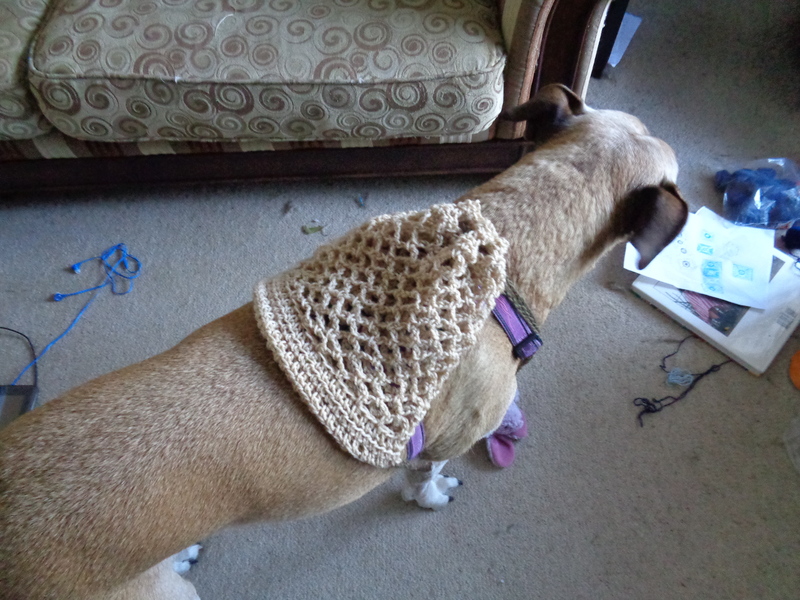 It is crocheted in a large Bruges Lace. It will be my final wrap for a while. This is the more advanced version of Easy Windows Wrap. The difference is the changing color! 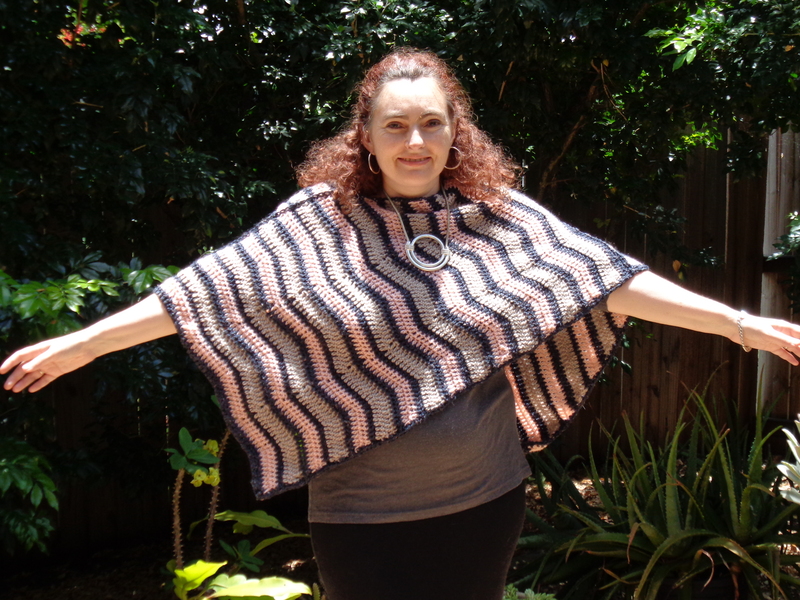 And I have hardly taken mine off since I finished it! Inspired by the success of the Blanket Wrap we have now completed the Easy Window Wrap. …or winter subtropical days, depending on where you live! 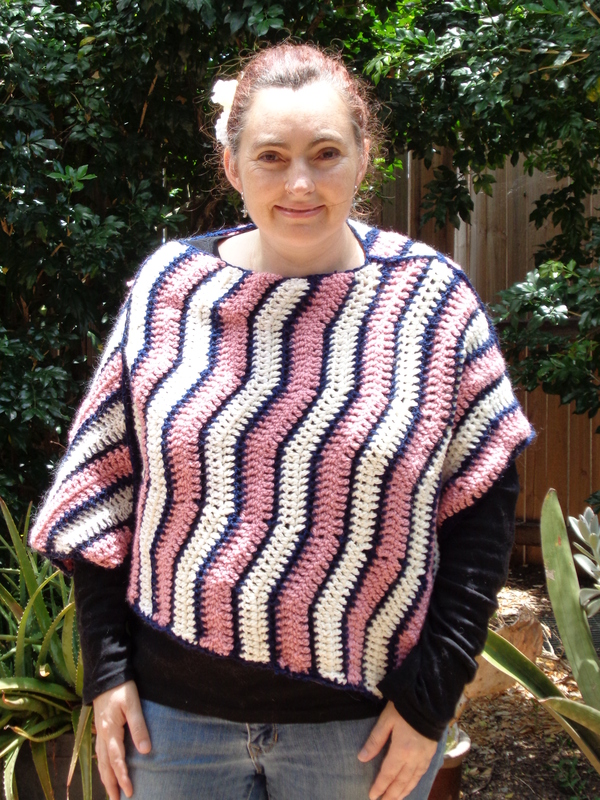 The pattern is on sale at Ravelry.com if you’d like it. 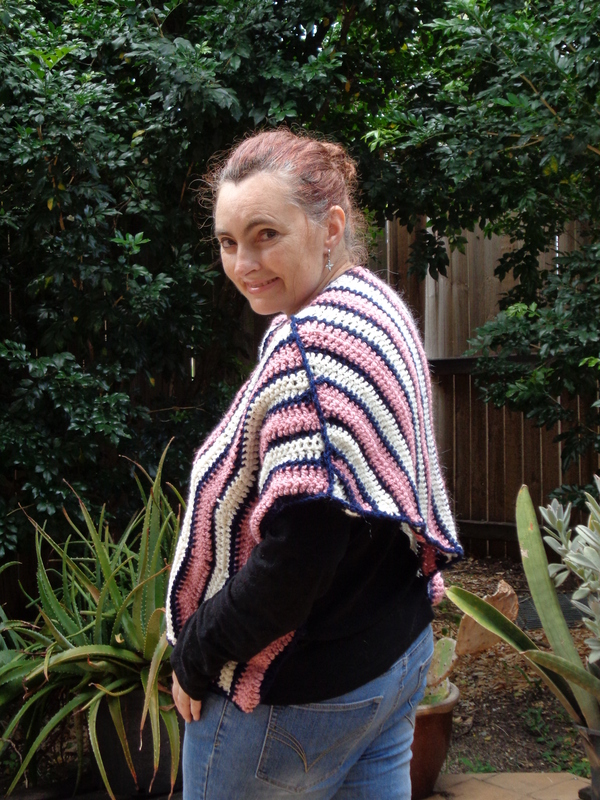 Winter is finally upon us in the southern hemisphere, and what easier way to warm up with a handmade wrap? 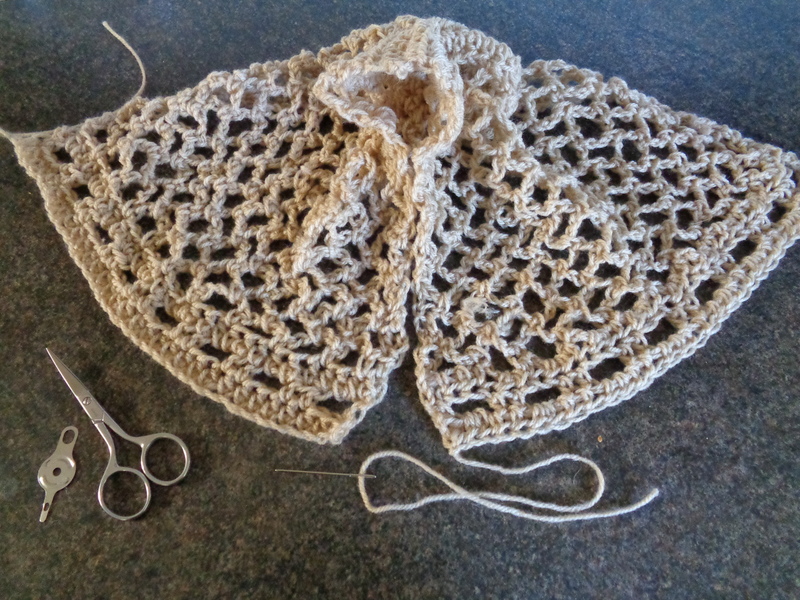 It’s a beginner way to make a warm garment. Finally the work in progress comes to fruition! 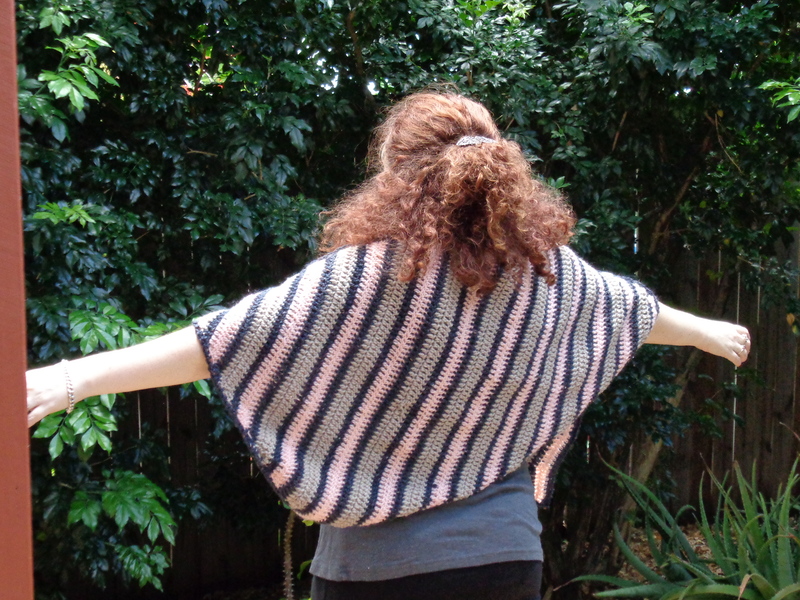 Introducing the diagonal poncho. 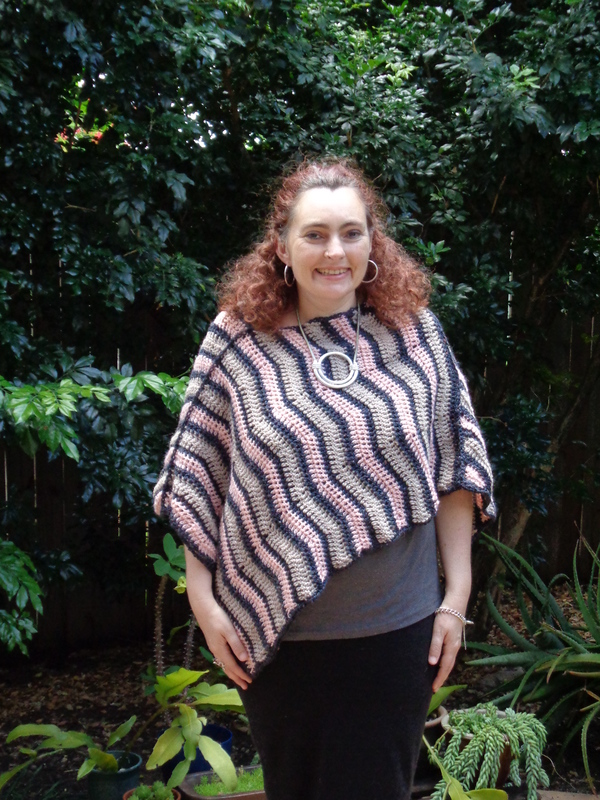 A new easy crochet design from DKO designs. 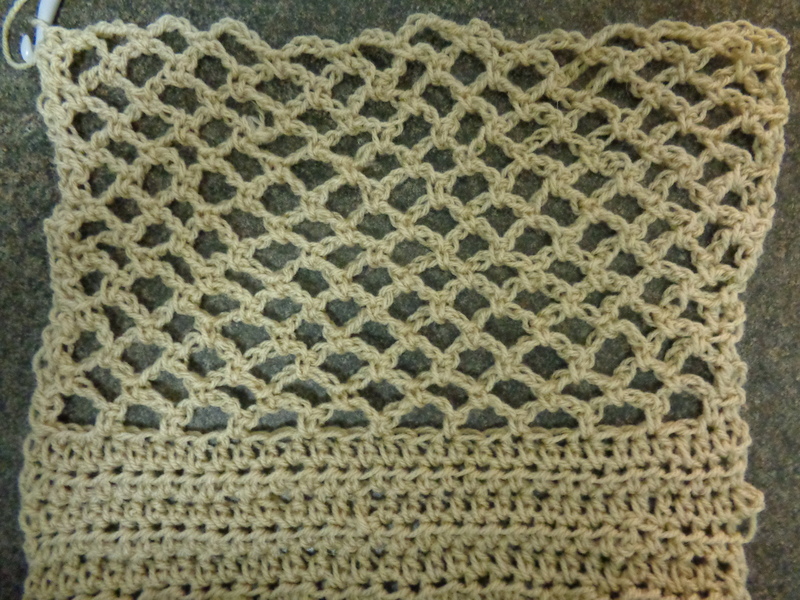 Details about the pattern can be found here. 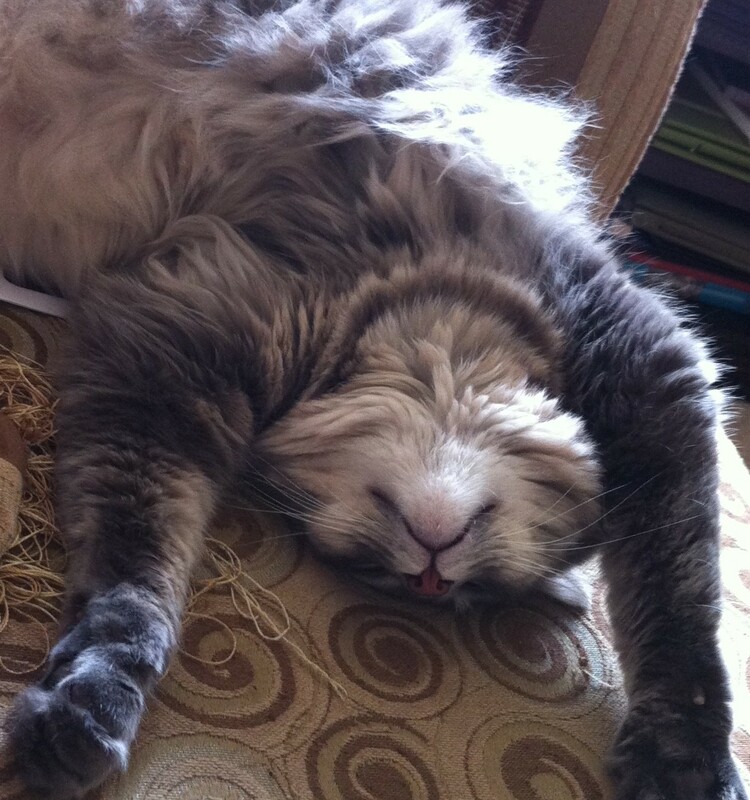 Mee-ow to you all. It is I, Mimi. 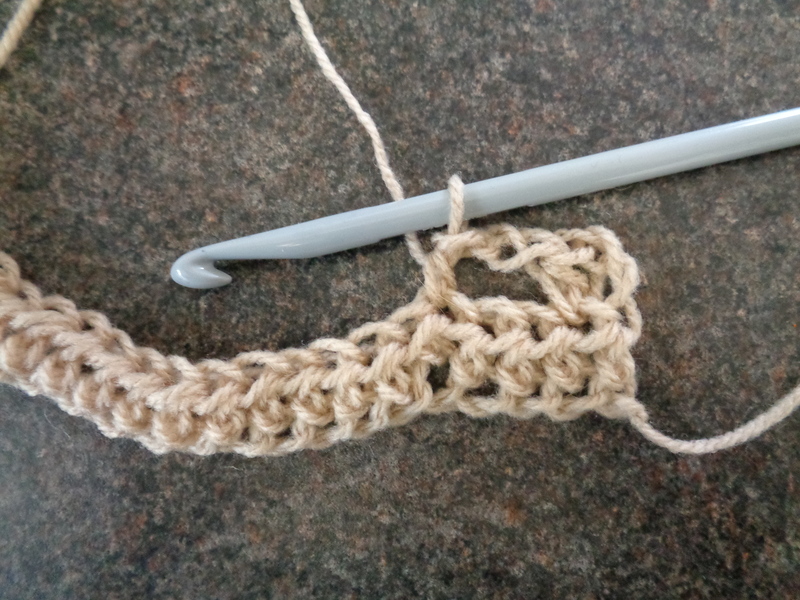 Learning new tricks just takes practice – remember we were all beginners once! 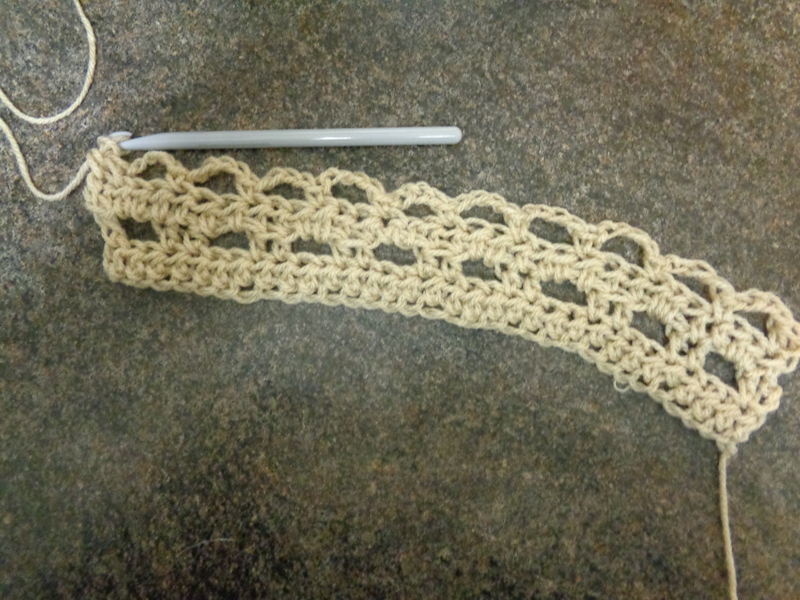 I just wanted to let you know that the first of the Easy Technique posts are on their way, as is a new pattern. 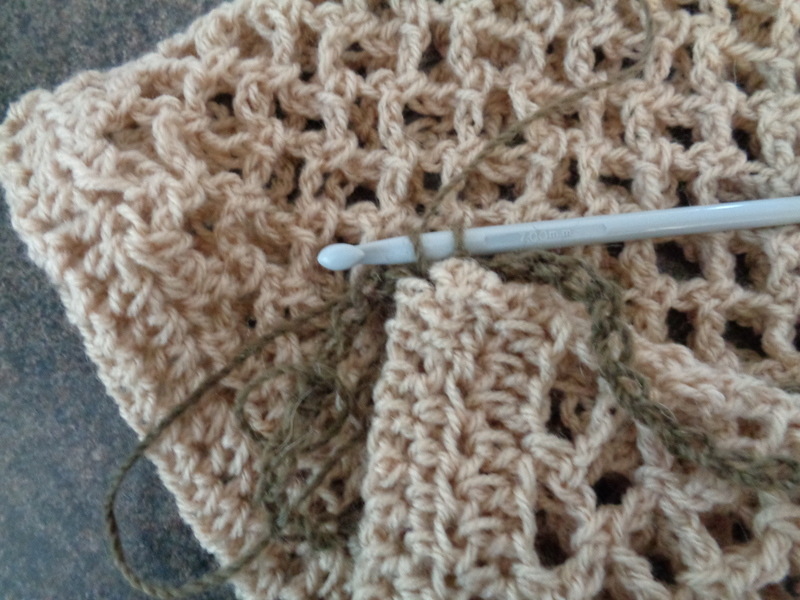 They will be listed under the new menu “Easy – Intermediate Crochet”! You’ve come at just the right time to finish off your back pack! Last time we finished the bag, today we’re going to make the straps and assemble the whole thing. 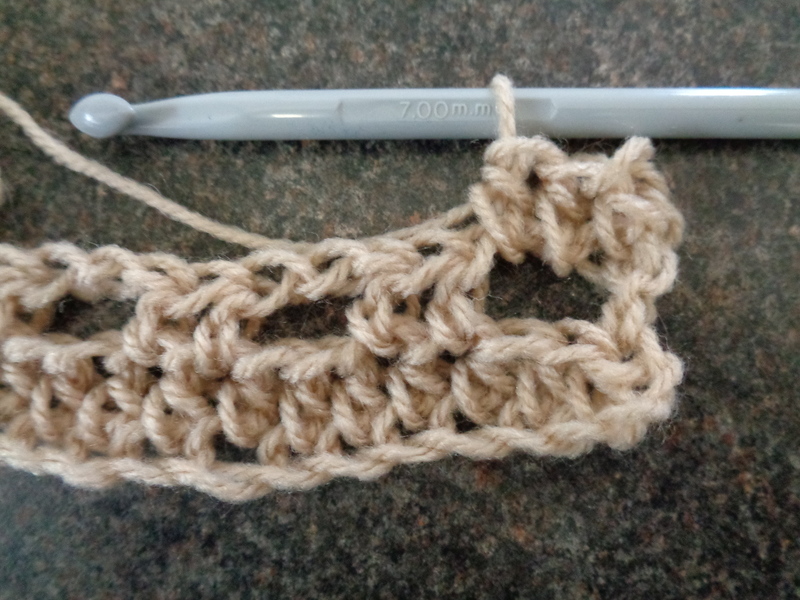 The first thing we do is attach the strap to the bottom corner of the back pack starting with a single crochet (sc) in the corner. 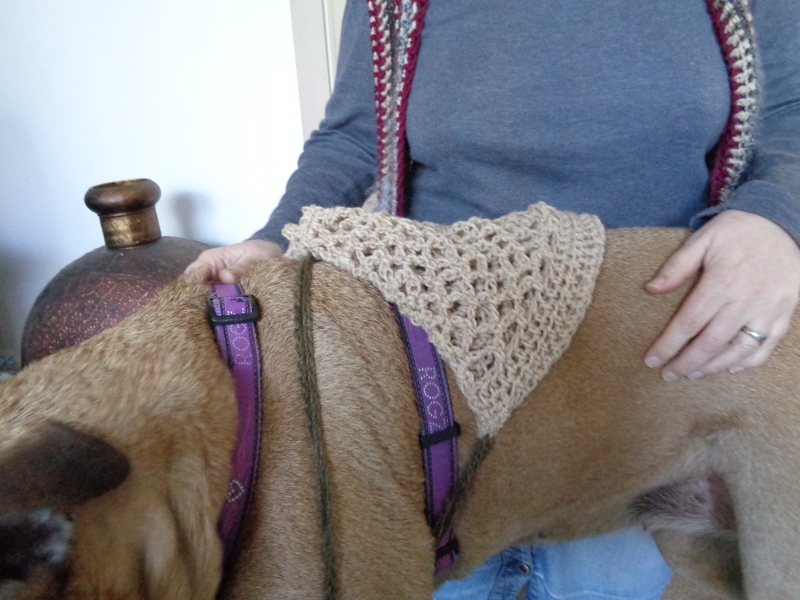 I’ve chosen a lovely brown wool for the straps to match my ears. 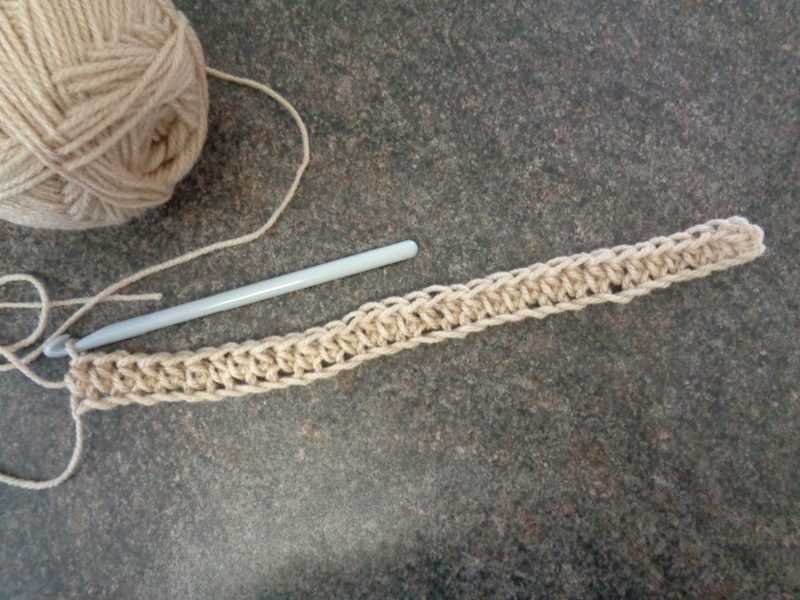 Next we do 135 chain stitches to make the strap itself. 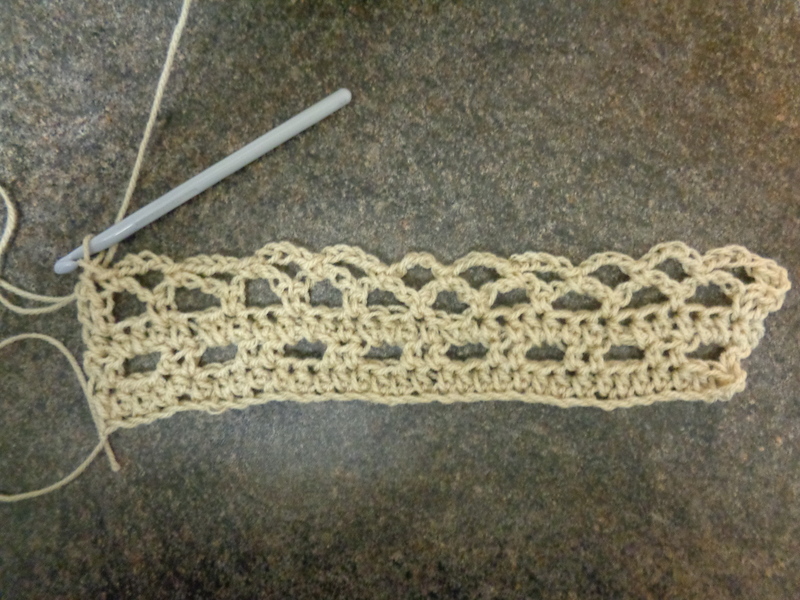 After that we weave the strap through the eyelets at the top like this. 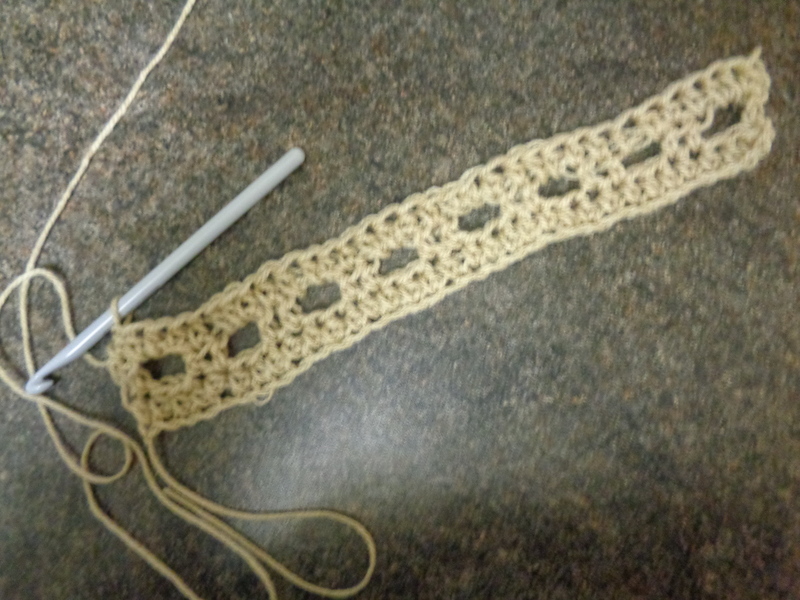 Then we take the strap out the last eyelet and sc the end back to the beginning. 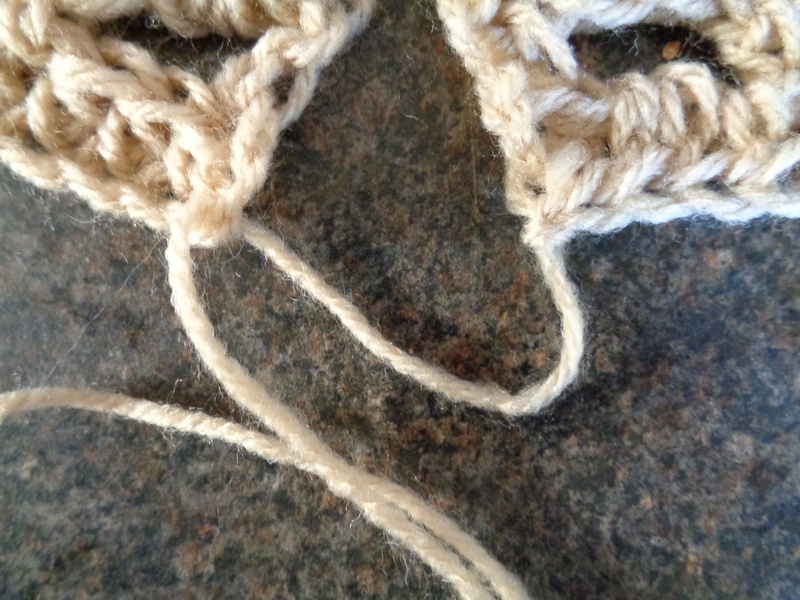 And weaving the strap through the eyelets to ensure it is in and out of the SAME holes as the previous strap. 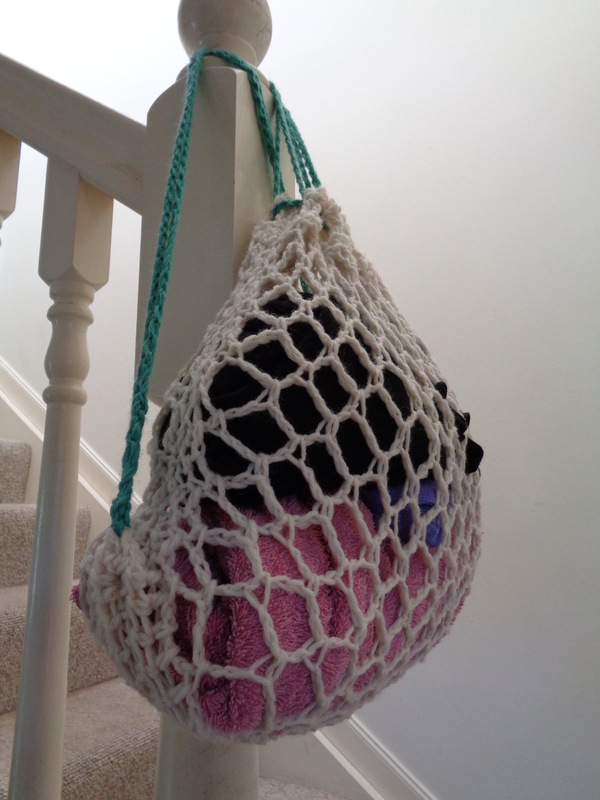 Once you’ve secured your second strap back at its start and sewn in the ends, you have a finished back pack like this! 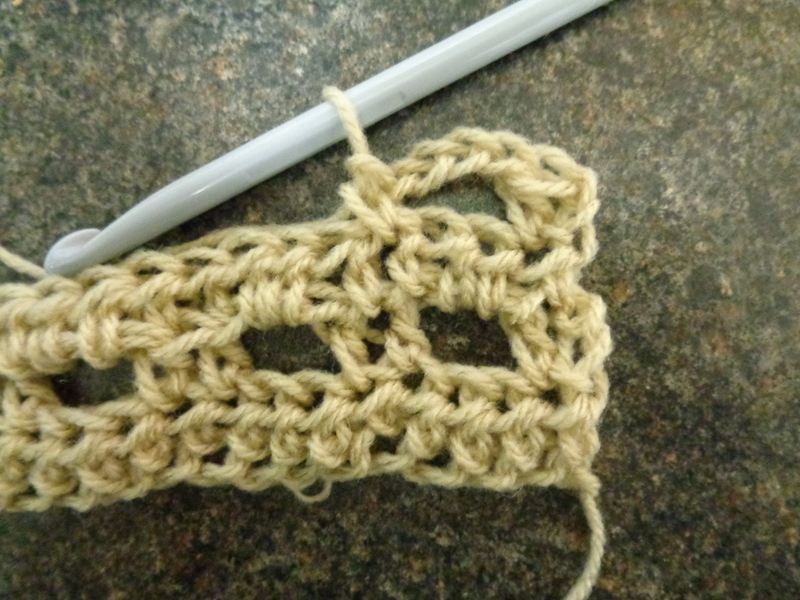 This was the last of the DKO designs beginner crochet tutorials. Woof and Welcome, I hope by now your backpack is coming along nicely. 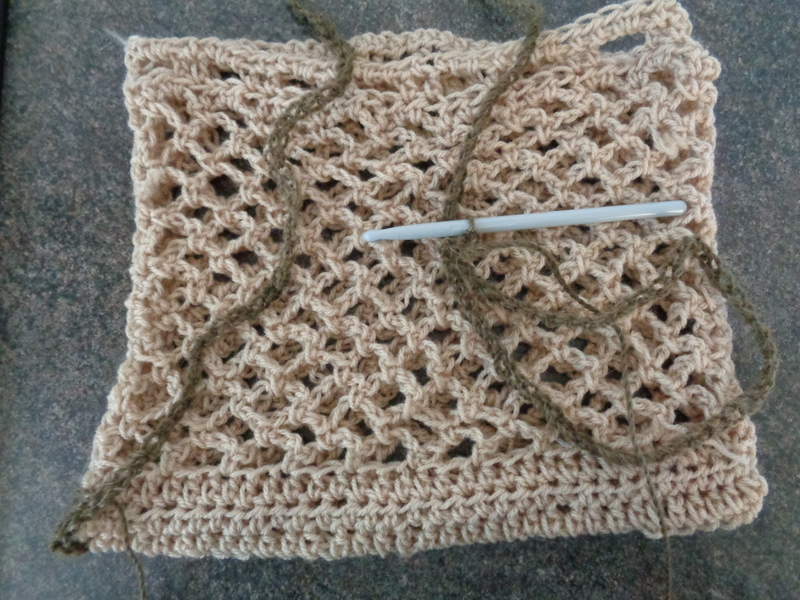 In the last lesson we started the actual crocheting of the backpack. In this lesson we’re going to focus on the middle to the end, including sewing it into a bag… but not including the backpack straps. Ambitious, I know, but let’s see how we go! And then we just keep on going that way till the end of the row. The row after that is plain hdc, as are the next 4, and you can do that standing on your head by now I’m sure! But make sure you count them carefully. If you look at the picture can you see that every second row of hdc produces a ridge? 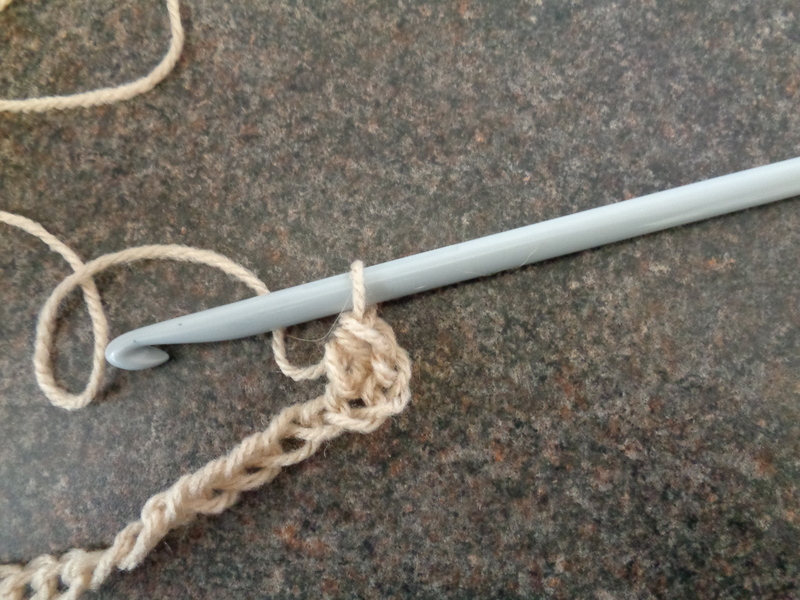 Also check that the wool ball end is on the same side as the end attached to the first chain, this means it is an odd numbered row. And then you continue to do more Row 5s until we reach the end of row 37. But please remember not only to count your rows but also your mesh spaces across. There should be 10. As you can see here I forgot to count my spaces and wound up with too many. 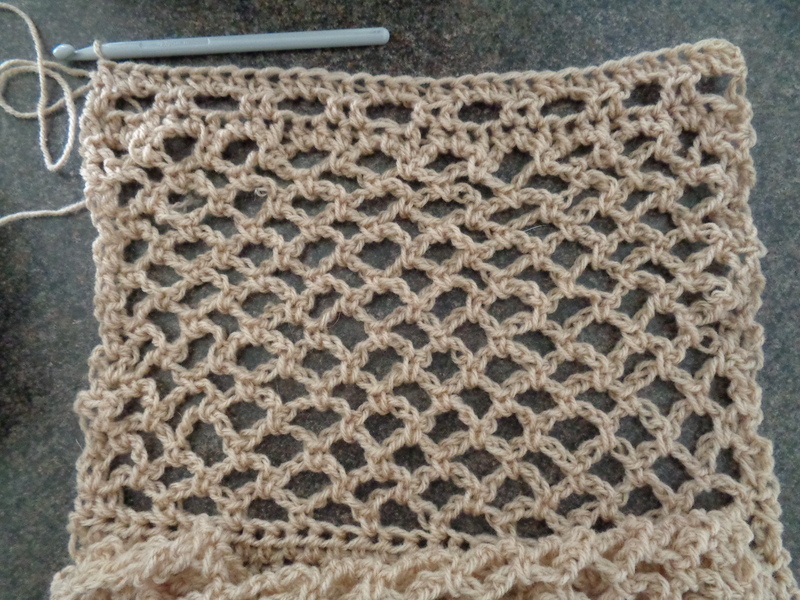 Ooops.The problem starts around row 5 of mesh on the right. There is no solution but to unravel the rows back to the mistake and start again! So I did, and this time I got it right! 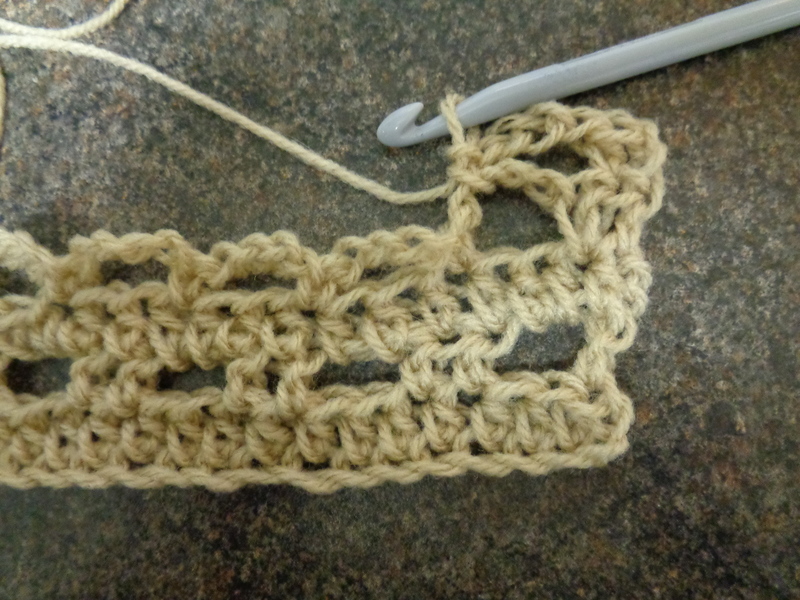 For Row 38 we repeat Row 18 which is the row we began with in this tutorial- a hdc into each stitch, and 2hdc into each space. 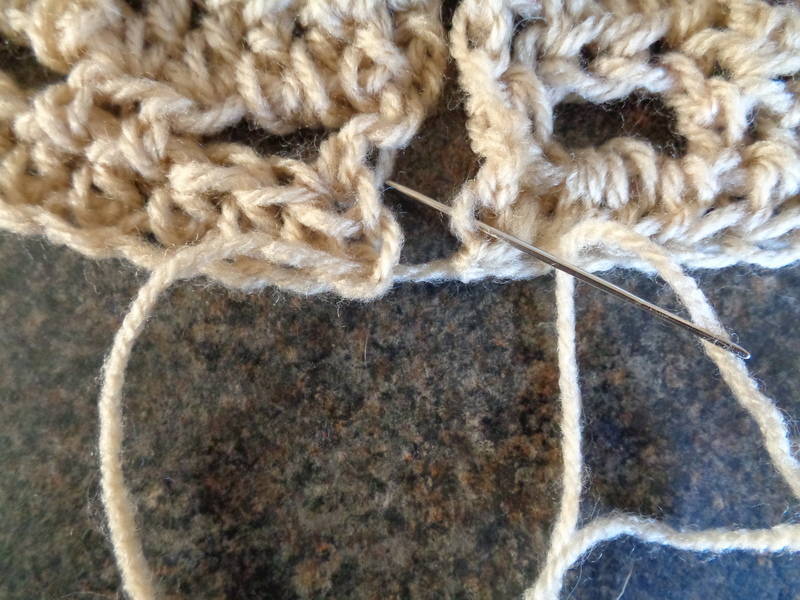 Then it is time for eyelets like we did in the last tutorial… you should have 8. 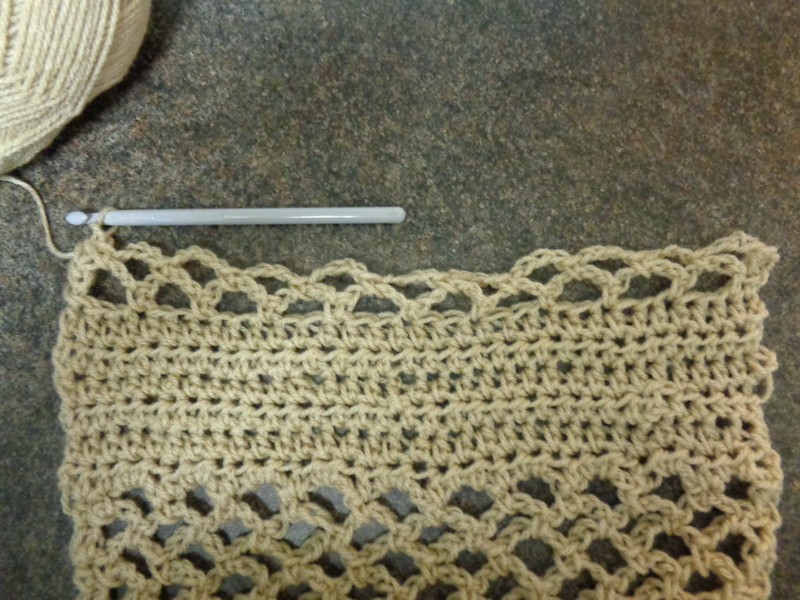 Then for our last row do hdcs, putting one in each stitch and 2 in each eyelet like this. See how it looks now? 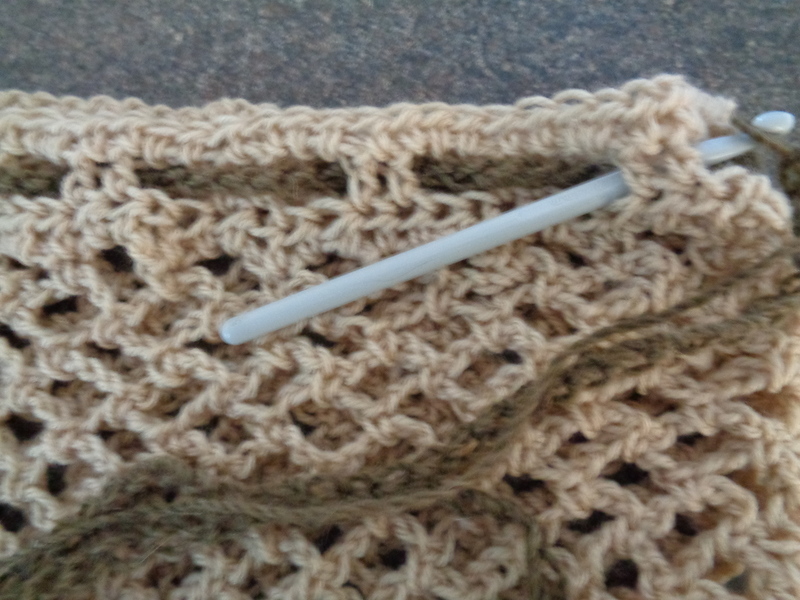 Finish off leaving the thread long enough to reach at least ¾ of the way down. 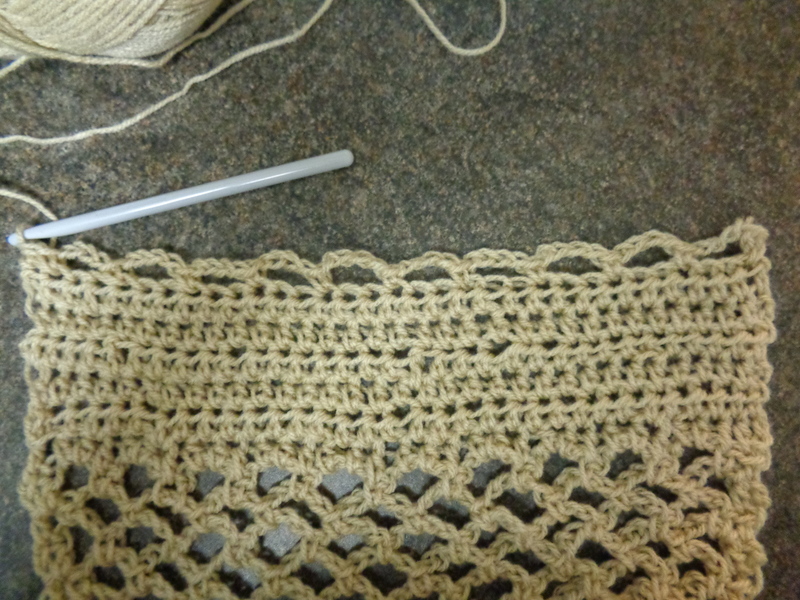 the crochet. And now it is time to sew! Firstly we’ll fold the bag in half, so you can see how it fits together. 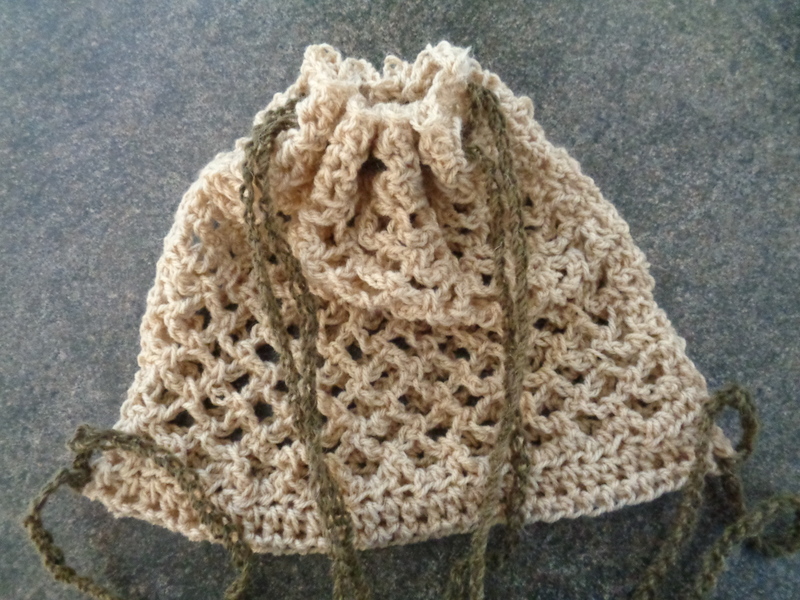 Now what you need to do is line up the two edges – a top and a bottom – like this to sew together and make the top rim of the bag. 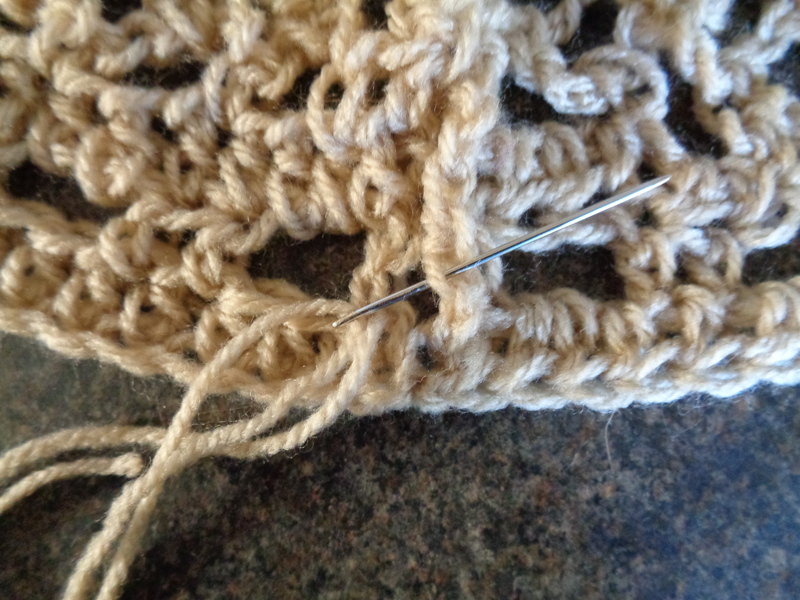 Then we sew it – under and over – into each side in turn like this. Keep going until you get to the top. 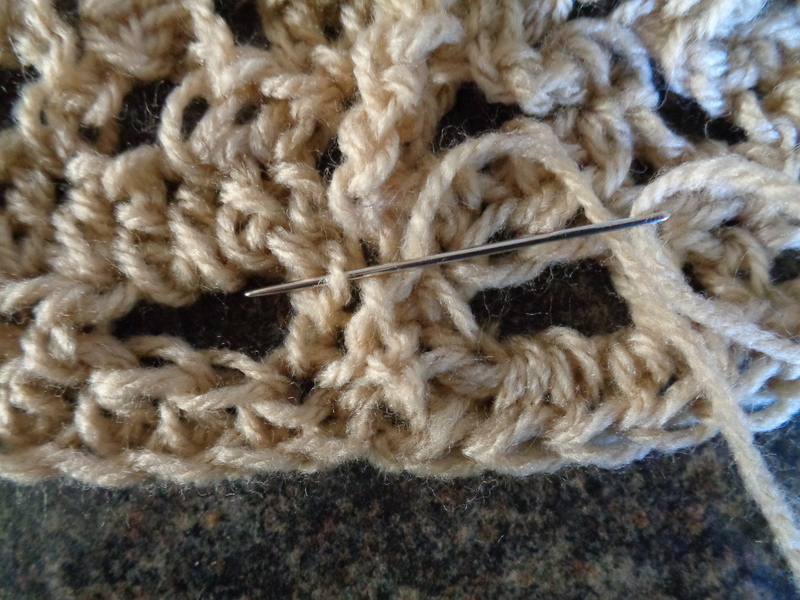 Then weave the needle through the fabric one way then back the other way to secure the end, and you’re done with that side. Sew up the other side the same way. If you don’t have enough thread to make it to the end don’t worry. 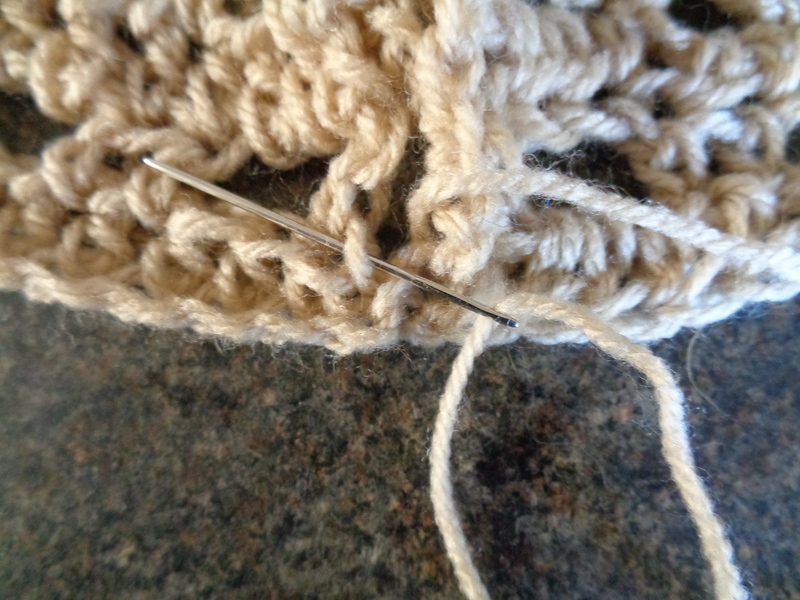 Just finish off as you did above, secure the beginning of a new thread in the same way and carry on sewing! Now you have the bag! Next lesson is the final lesson where we turn it into a backpack. 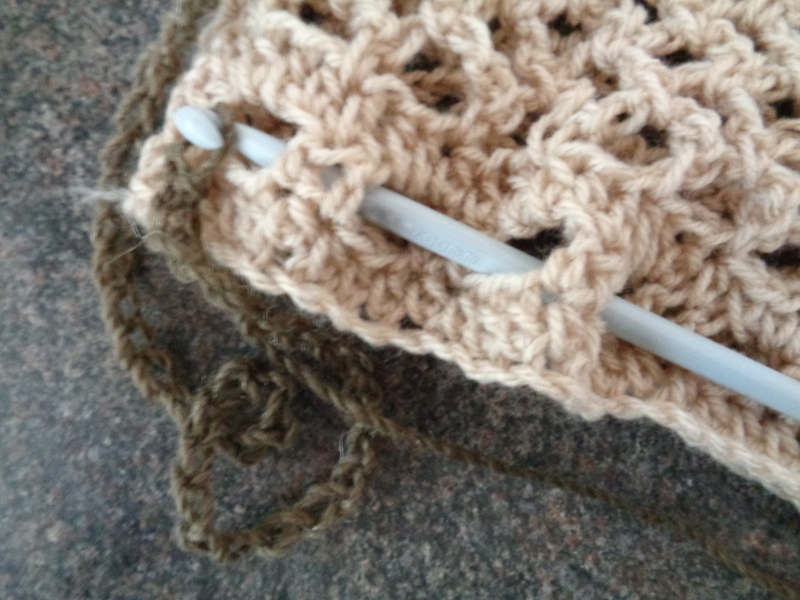 Happy crocheting and sewing, see you then! 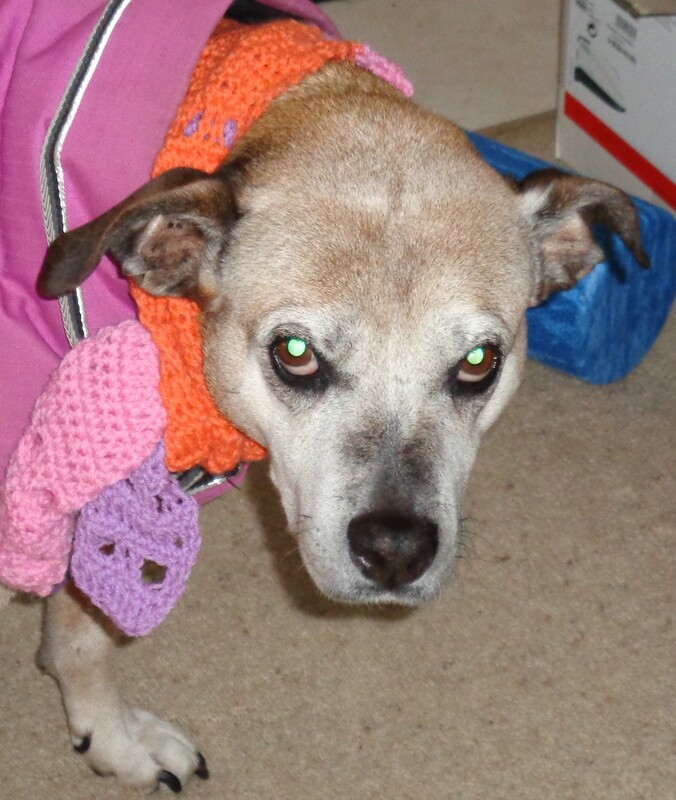 Woof and Welcome in this tutorial we’re starting our terrific beach backpack. This is how it will look when it is done. 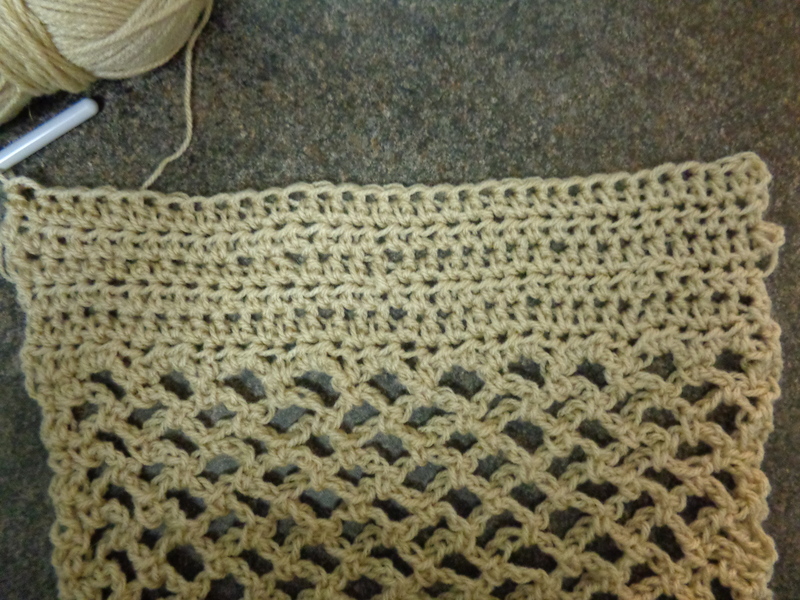 First comes 32 chain stitches (ch) as a foundation chain. This is quite a big number for me to count, but I have a trick that helps me. 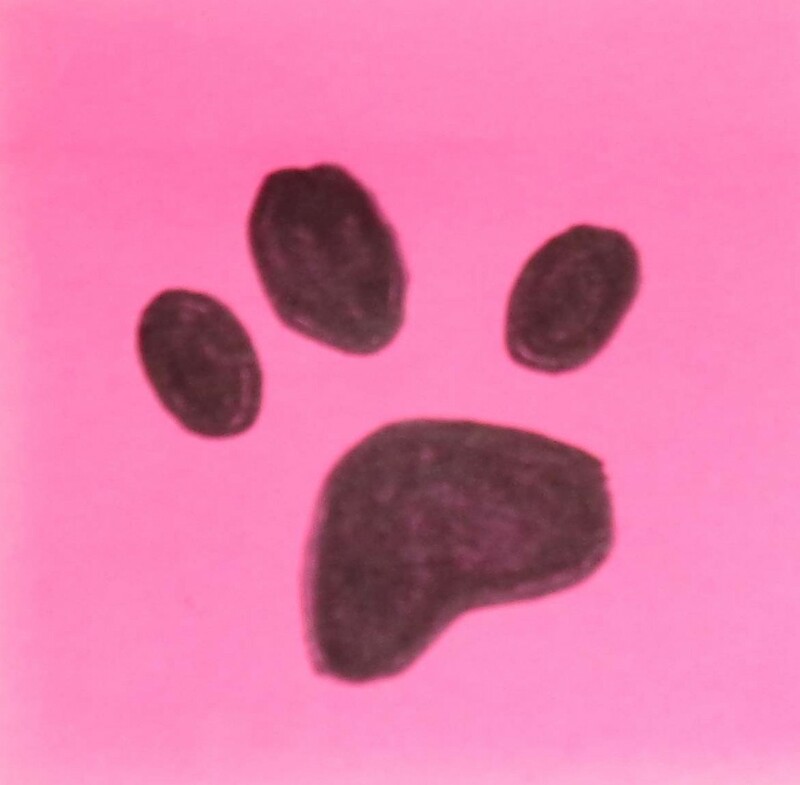 I always count my foundation ch out loud and then if I’m not sure where I’m up to I remember what number I last heard… maybe it is a dog thing, but it works! Oh and make sure you don’t count the loop on your hook as a chain. 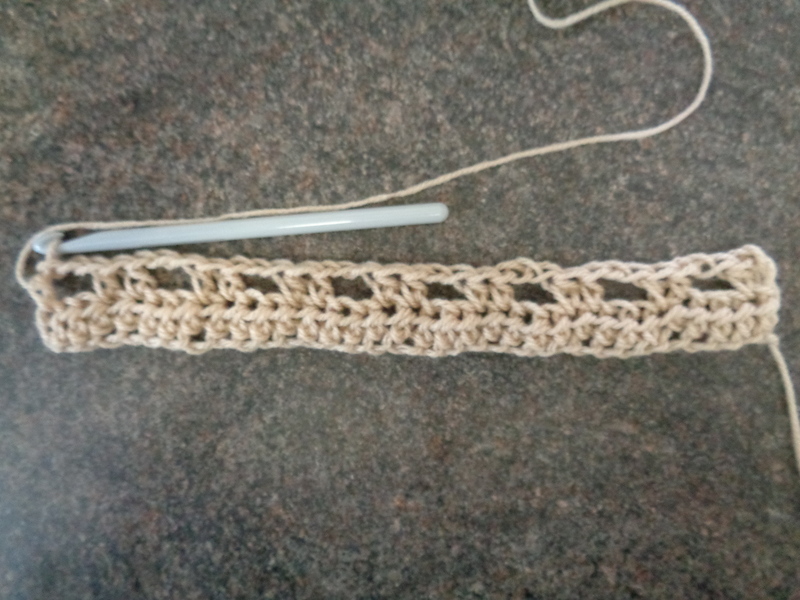 Next we do our first row of half double crochets (hdc). 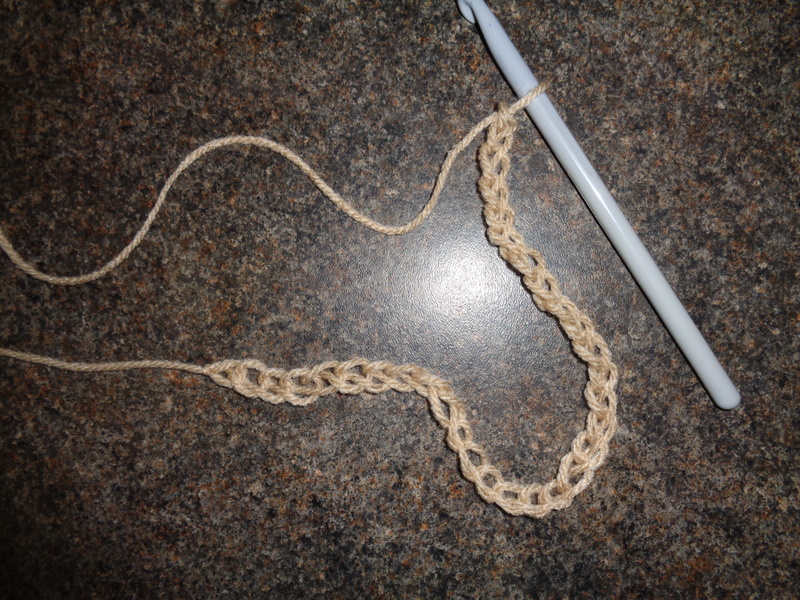 Start with 2 turning chain, then make sure you put the hdc into the third ch from the hook. 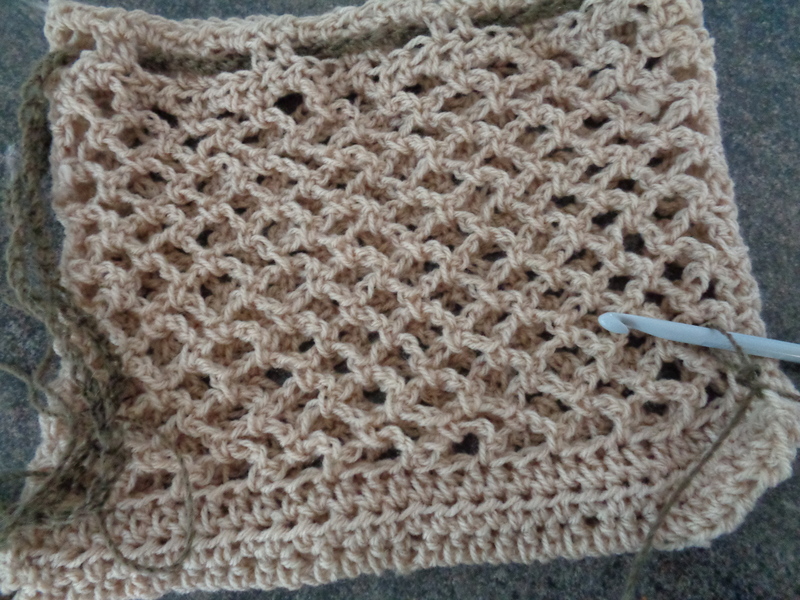 Then just finish off the row! 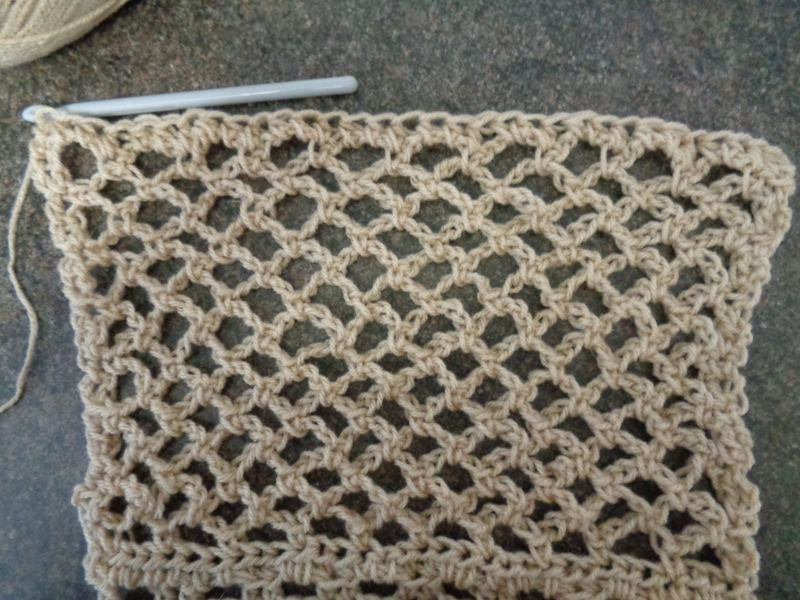 So for this next row we’re going to start the eyelets that will go at the top of the bag. Yes this is the top! Trust me it is very clever. 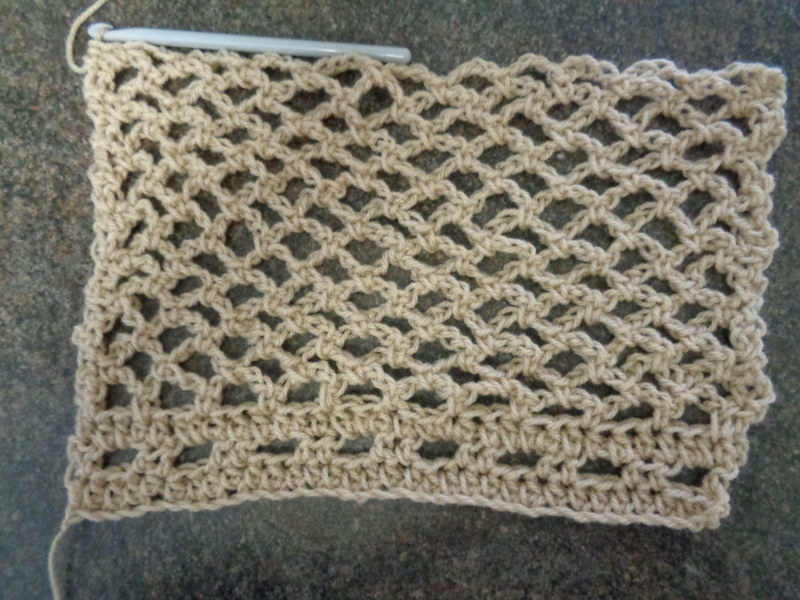 So now you can just repeat this pattern and finish the row. You should have 8 eyelets like this. The next row is another row of hdc. 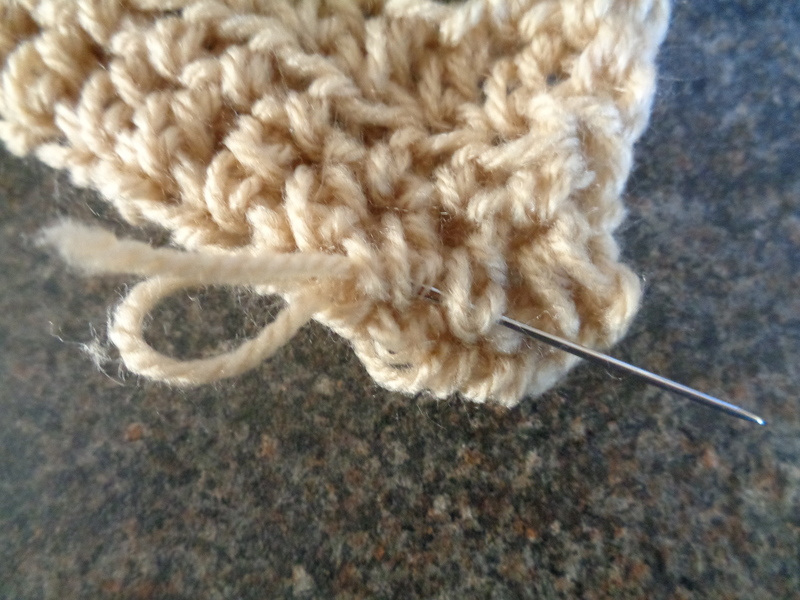 Just woof along the row putting a hdc in each stitch from the row below. 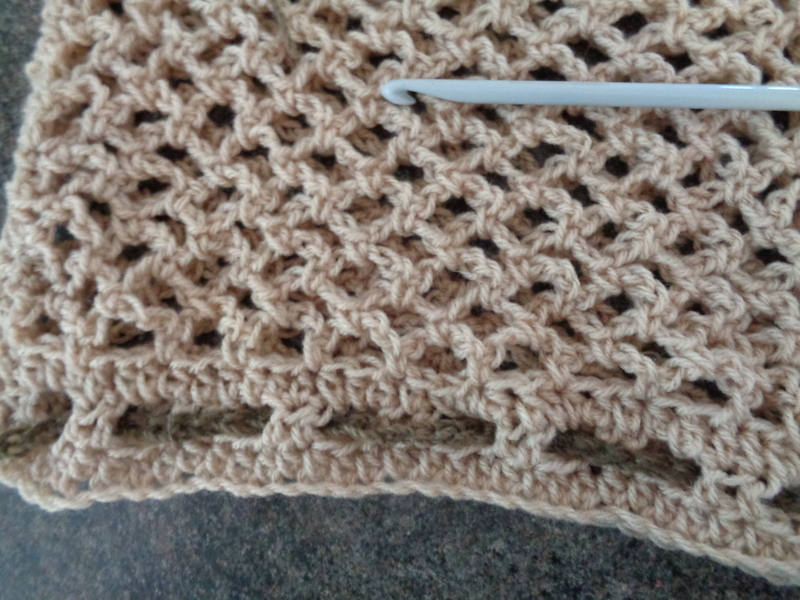 Instead of putting the hdc in the actual ch stitches, just put them into the eyelets themselves like this. Your finished row should look like this. 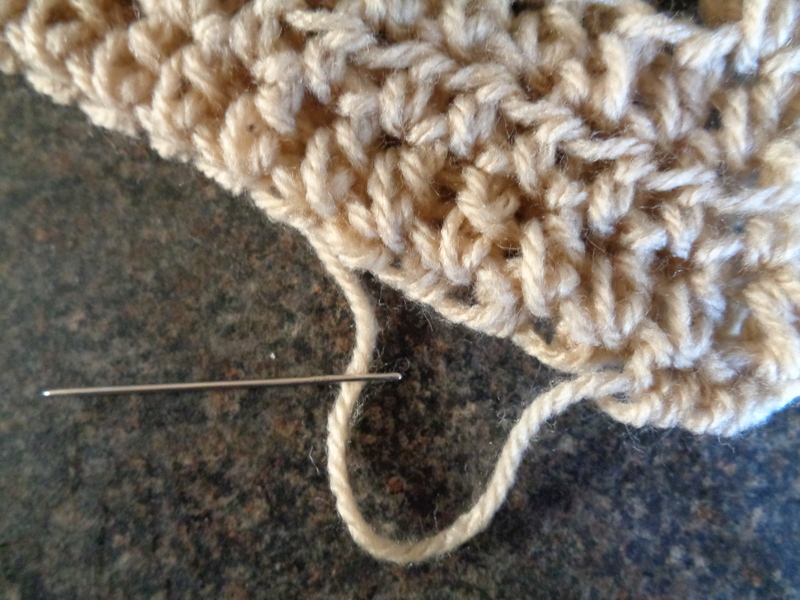 Don’t forget to count your stitches – there should still be 32! Now you’re going well, keep making mesh spaces until you get to the end of Row 17 and I’ll catch up with you there in the next lesson! Have fun and don’t forget to count! !